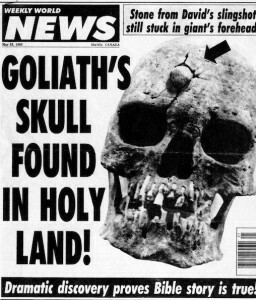 Goliath’s Skull Found in Holy Land! Mark kindly emailed me a link to Ben Witherington III’s blog post of 27 January 2011: ‘Finally, Archaeological Proof– Goliath Got Stoned’. The Weekly World News, for those of you who haven’t encountered it, is famous for stories about Elvis sightings, aliens, human-bat hybrids, and various supernatural beings…not to mention the odd Giant. It seems the story was later picked up and published as though it were a genuine archaeological discovery inThe Kingdom Times (Belfast; May 1994), a publication of the British Israelites. BW3 was having wee joke with us, you see.